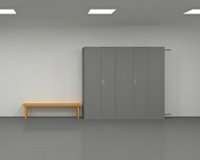 Escape from the Strange Locker Room - No, Hottategoya's locker room isn't strange because it's clean and fresh smelling, but because of the mysterious hints and codes hidden about the room. If you ever want to see sunlight again, then find them all and put them to good puzzle-solving use. The single room is a welcome attribute for players who skipped this author's maze-like offerings. Here the focus is solely careful observations and decoding clues rather than catching your bearings and finding your way around. All in all, it's the standard Hottategoya affair: solve three codes and you're out—a pleasant escape with smart puzzles, albeit too short to fully satisfy. Find the Escape-Men 116: The Crisis - a bomb "Oops!" is not a good thing. Those last few seconds of your life can feel like an eternity, though. Maybe that's enough time to save yourself? With a little help from your little green friends, that is. Just remember to look floor to ceiling, as No1Game's unchanging cursor isn't much help and there's not always a navigational indication of where you can go, because the challenge is less about solving puzzles and more about the actual seeking of escape-men. Alone they aren't much help at all—considering how they like to hide behind specific pixels or leave you waiting a long time before deciding to show up—but together they form one mighty hero. Button Escape 23 - Tototo Room knows how to make a game of "find the little grey spot and click it" be a lot more enjoyable than it sounds like it is. Sometimes it's simply a matter of using keen eyesight, looking closely for even a fragmented peek of grey circle, and other times you'll have to piece together the clues to solve puzzles and open doors. You'll need eleven buttons to open the door, then you're free! There's not much more too it than that; we could discuss its quirky hand-drawn aesthetics or unchanging cursor like the last time, but the remarks are mostly the same: fun! Weekday Escape N°37 Walkthrough now available! Puzzle: Shapes on wall – find clue on the orange painting. Puzzle: Blue safe – figure out the missing numbers from the red safe (3-4-9-6) – get key for orange painting. Puzzle: Red box – use key on orange painting. A clue is on the back of the painting. Look at the red box again. Click left side so you see a number (and a tricky button hiding). Use the number. Open box by pushing top right inner corner. ...and that is why a Bomb Kick is always a wise investment. You can only hunt pixels for so long. Stare at a suspiciously blank patch of wall for a moment. Still have to play button escape but so far these are the perfect type of escape games for a little break in the day. Enjoyable little fun. Now if I can just find some educational escape games for my students. the side of the clock, the sign on the door, side of the bomb, backs of both pieces of paper, broken brick, waiting by the broken brick, under the bricks, and the 3 letter code. I also have a crowbar that I can still use. I think you're missing the same Escape-Man Kurt was missing. Anybody completed Button Escape 23? I am stuck on the 3rd and 5th buttons on the top row. I have unlocked the "How Much?" picture on the left but I don't get it. I also need the code for the red book (?) on the right. but don't know what to do with the info there. jbeaver, how did you get button 8? All escape games are educational! How long should I stare at that patch of wall? Are you referring to the wall to the right of the safe? That's the only spot I'd consider suspicious, since the safe is offset to the left. I never knew that escape men were a real thing. I just got back from Japan and was surprised and hilariously amused to see escape men as symbols in every exit sign in stores. I had to stop and stare. Also, I went to the Cup Noodles museum and saw little yellow chicks everywhere. I never knew that these little chirps existed outside of escape games!!! Who knew?? It is inside the red box. To open the red box use the key from the blue safe on the orange painting and get a clue. Now click on the red box on the left side to see a number. Put in the number and you get a white package. To open it you must click somewhere around the top right corner. Now I just need button number 3??!! That's exactly the spot I'm referring to. Give it ten or fifteen seconds. Thank you gavtyen! I figured out button number 3 from your clue too. Check the left side of the box, where the yen note is. Check the upper right of that screen. Dang it unintentional double post. Why, computer, did you not update the comments when I posted the first time?? #10, #10, where art thou #10? where exactly is the paper on the Left side of the bomb? I swear I have clicked every pixel! Zoom in on the lower left of the bomb. The paper is an ever-so-slightly lighter shade of gray than the bomb itself. Play with your monitor contrast if you still can't see it. okay i have tried all levels of contrast and still cannot see any paper. On my monitor the bomb is black and has a white semi-circular strip of "highlight" in closeup. It's sitting on an aqua background and on either side are gray bricks. The bottom of the bomb intersects with a navigation bar. What should I be clicking closer to? the loose brick between the V and the III AND waiting for the other one to show. the one on the sign and the one under the door are the same one. So I'm still missing one. 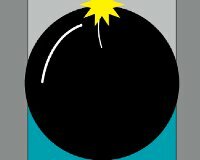 click to the lower left of the bomb in the blue space between the bomb, the floor, and the wall. When it goes to close-up, the paper is a gray square that looks kind of like a light reflection. Took me awhile to see it too. Sorry, that second spoiler was intended for spike21. Sorry again! THIRD spoiler was for spike21. It's late. Go to the wall with the safe and look up for a balloon. man I clicked every square millimetre of that thing before I found it.. The one from the left of the clock. The one that turns up after a while behind the broken brick. floating green giant head guy appeared in the game while I was scrolling down the comments. I would have never found that one on my own if I hadn't accidentally been looking in that direction in the game when I clicked over to JIG. But I did get out pretty fast despite this one having several accidental-finds. That green guy is going to need some pepto! Where do balloons go when you let go of them? floating inside a balloon above the safe, if you click the upper part of the wall. Love the Bomberman reference in EM! To open the 80 locker, look for a clue in one of the other lockers. Spell out EIGHTY by clicking the corresponding locker in order. To open the box, look for clues in 3 different locations. The lines make up the numbers you need for the box code. The code for the 4x4 panel is in another locker. You might need a pen and paper. One set of lockers reveals the path you need to draw. But it's incomplete? The arrow buttons shift the lockers over so you can see the whole thing. I couldn't find the last one despite a list of their locations. I never saw the one listed as "under the bricks"
I can't get anywhere in the Locker Room game. I have a solution to a code, but nowhere to use it. All the lockers that open are empty, other than the strange markings. Got it. I hadn't noticed the comment here from prasanth.akundi with the hints for that game. The first hint got me going, and it was easy after that. i guess there are no walkthroughs for the men and locker games? I enjoyed the button games however I got stumped a few timers but fortuneately I figured it out. Paul, there should be enough hints here in the comments to at least make an attempt at all the games - for example, see Hespetre's comment directly above yours for a list of the EM locations. 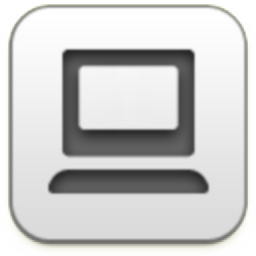 Button Escape consistently crashes my browser (Chrome 36 on Mac OS X 10.8). I'm not sure why, since other Flash games work fine. Damn.